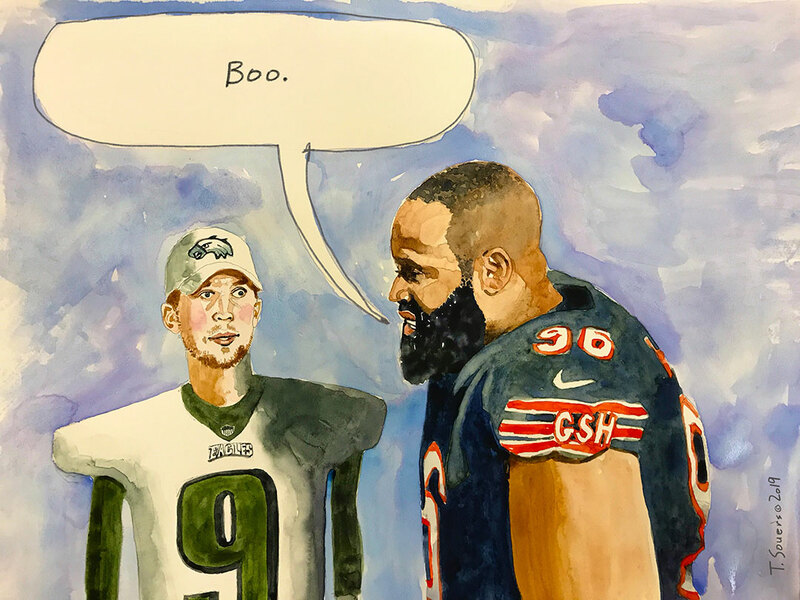 Home » Friday Funnies: Bears vs Eagles. Friday Funnies: Bears vs Eagles. There is nothing that could possibly make me happier than the Bears defense being a Bears defense. In a couple days... Happy Sunday, you all. "Jim Bowden of The Athletic was told by a source that the Nationals' last offer to Bryce Harper was "much more than the $300 million being reported by the media."" hell, it's not even a given that he'd be an adequate LF'r. it's not where he's playing in the OF that seems to be the problem. his routes and tracking are a bit subpar. How many “good” players can be signed for that 30+ a year? You could at least get Machado, who gives you better positional flexibility on the roster and might be the better overall player. for this offseason it seems the biggest cubs issue is how many "good" players can you sign for a few bucks of spare change found cleaning out maddon's party van. i mean, they have to do something to shore up the pen, but it seems like they're in no hurry to get involved with anyone until they can find some revenue relief. at least, it seems that's the biggest rumors involving the team...free'ing up loot to do something else. the ricketts family has saved a lot of money now that they don't have to throw 10s of millions in anti-obama and help-us-get-political-office efforts. let's reallocate that loot, fam. Remember in 1992 when they signed 4 players for what they would have paid Maddux and Dawson? Phil, when does the Instructional progam start. ?I know the Cubs did away with the Fall Instrcts. yanks snag z.britton (expected by many after a.miller signed with the cards)...the pen market gets thinner. Robbie Gould is a free agent. jdmym: A player on an MLB Reserve List (40-man roster) who is signed to a split contract is paid at the "major league rate" each day he spends on an MLB Active List (25-man roster) or MLB DL, and he is paid at the minor league rate each day he spends on optional assignment to the minors. A "split contract" is not usually guaranteed, unless the player has negotiating power (like if the player is arbitration-eligible and settles with the club prior to going to a hearing, or if the player is a free-agent after maybe being non-tendered or after being outrighted to the minors and has less than five years of MLB ST so that he can be optioned to the minors without his consent) and uses that leverage to get some or all of the contract guaranteed. Otherwise, split contracts are not guaranteed, especially if it's a run-of-the mill pre-arbitration (auto-renewal) player. As far as an Outright Release is concerned, a player on an MLB Reserve List (40-man roster) signed to a non-guaranteed contract who is released more than 15 days prior to Opening Day receives 30 days salary as termination pay (paid at the "minor league rate" if the player is signed to a "split contract"), and a player on an MLB Reserve List signed to a non-guaranteed contract who is released 15 or fewer days prior to Opening Day receives 45 days salary as termination pay (all players paid at the "Major League rate"). A player on an MLB Reserve List who is released during the MLB regular season receives 100% of his salary as termination pay (paid at the "minor league rate" for players on Optional Assignment to the minors). However, a player cannot be optioned to the minors and then released if the purpose of the Optional Assignment was to avoid having to pay termination pay at the major league rate. NOTE: A player who is optioned to the minors and then released would normally file a grievance, so a club has to be careful not to be too blatantly obvious about it. j.jay returns to chicago...for the wsox. he'd be a 4th OF'r for a lot of teams, but he may actually get some regular playing time with the chaotic wsox outfield situation. "CUBS FANS - something big coming out at Cubs Convention next weekend! STAY TUNED"
Probably a charity golf tournament he'll be organizing. high probability of something golf related...or waffle related. I'm going to guess clark was metoo'd and is going to have to start wearing pants. seems to be a sort of "from our perspective" player(s)-to-fans art project giving fans insight to how the players view the game/people as well as wrigley field, itself. neat of him to put the time and effort into it. ATT Park (SF) is now "Oracle Park"
also, Safeco Field (SEA) is now "T-Mobile Park"
Phil, can you tells us what young Latinos are now in instructs? mets sign j.lowrie 2 years..
russell "only" got a 200K base raise, but he's eligable for 600K more if he's on the roster 150 days. the news of russell getting this contract is going over like a lead balloon on twitter with cubs fans. So have they saved enough to sign a second rate relief pitcher? They say Russell's contract is prorated at $2.8 MIL due to his suspension. Now does it cost the Cubs as far as the competitive tax calculator $2.8 MIL or $3.4 MIL (Excluding bonuses)? cubbies.4ever: A club's luxury tax liability is calculated - AFTER - the conclusion of the MLB regular season, and any performance bonus earned by a player is included in the AAV. So Addison Russell's 2019 contract AAV cannot be determined (for sure) until after the conclusion of the 2019 MLB regular season, but it will include whatever salary he is actually paid (salary forfeited while suspended does not count toward the AAV) plus any performance bonus (roster bonus) he might earn. OK, that answers my question. OK, that answers my question. I just didn't know if his salary foreited while suspended counted. So it's $2.8 (assuming he remains a Cub all year, not traded, DFA, etc.) + whatever bonuses he hits. Not $3.4 + bonuses. "Nolan Arenado requested $30 million and was offered $24 million by the Rockies when arbitration figures were exchanged on Friday." wow. either way that's an arbitration record. crazy. AZ Phil, can Russell join the team for Spring Training? HAGSAG: Addison Russell can work-out with the team but he cannot play in MLB Cactus League Spring Training games. He can, however, play in a Cactus League "B" game on a backfield, minor league Spring Training games, and Extended Spring Training games, prior to beginning his official 12-day minor league conditioning assignment (probably at AAA Iowa on 4/20). Whatever he does prior to being reinstated will be without pay (salary), but he will receive MLB meal money and accomodations when on the road during his official minor league conditioning assignment. He actually isn't required to do anything prior to being reinstated, although if he declines to participate in backfield activities during Spring Training, Extended Spring Training in April, and the 12-game minor league conditioning assignment, the Cubs could delay Russell's return to their MLB Reserve List (40-man roster) for up to 30 days beyond the end of his suspension, and then fhey could just option him to the minors for an indefinite period of time after adding him back to the 40. So it's - VERY - likely that Russell will do everything he can to get back on the Cubs MLB Reserve List at the earliest possible date (which is 5/2, barring rain-outs during the first 35 days of the MLB regular season that are not made-up prior to 5/2) so that he can begin to earn his roster bonus. I suspect that's part of the reason the Cubs offered a roster bonus as part of his contract, to help motivate Russell to participate fully even though he is not being paid during the suspension. "Cubs signed C Francisco Arcia to a minor league contract with an invitation to spring training." his skills include having a pulse, legs that work, and an ability to open and close doors. his pitching skills fall well behind other HOF-calibre pitching catchers like david ross. Over the past month the Cubs have signed 12 free-agents to 2019 minor league contracts: OF-!B Jim Adduci, C Francisco Arcia, OF Jose Cardona, INF Ryan Court, INF Phillip Evans, OF Evan Marzilli, RHRP Carlos Ramirez, RHRP Allen Webster, and LHRP Mike Zagurski were signed about 3-1/2 weeks ago (after the Rule 5 Draft), RHRP Matt Carasiti was signed about ten days ago, and OF Zach Borenstein and RHSP Colin Rea signed last week. Presumably most (if not all) of them got an NRI to Spring Training. We seem to be scraping the bottom of the barrel. he's supposed to play all over the place until/unless tulo shows himself to be ineffective while g.torres plays 2nd until he's ready to slide over to SS. Anybody think something exciting will happen before the Convention? i can't wait to hear about who's fixing jason heyward's swing this off-season. also, where in wrigley are they going to put another jumbo screen? the big news of who's going to play concerts and destroy the OF should be interesting, too. the most beloved pitcher in all of chicago. So, then, the big reveal at the Cubs Convention will undoubtably be the new Clark and Clarkin Radio show. And podcast. Obviously. Flight through Sky Harbor, perhaps. "ESPN's Jeff Passan reports that the Yankees have a three-year, $27 million agreement in place with free agent reliever Adam Ottavino." the yanks have solidified one hell of a pen this offseason. the cubs...umm...well, kyle ryan, i guess. there's still some "names" out there, but it's getting thinner. I am depressed because of no ACTION ! Cubs signed RHP Rob Scahill to a minor league contract with an invitation to spring training. Yu Darvish is set to begin long toss in a couple days and is about a week out from his first planned bullpen session of the spring. Says Opening Day is a realistic goal for him based on his progress. "Kris Bryant said his shoulder is now perfectly healthy and he has been taking batting practice at full strength since December 1st." "Cubs president of baseball operations Theo Epstein said shortstop Addison Russell will get a "conditional second chance" to remain with the organization. The Cubs consulted with Russell's ex-wife (the victim of the abuse), and Epstein said "She felt like this was Addison's best chance to get his life in order."" cubs are expected to respond by signing a random 27 year old to a minor league contract any time now. "Sahadev Sharma of The Athletic writes that the Cubs have "bandied about the idea of trading Ben Zobrist this offseason." ...the team has evidently considered trading him for bullpen help and payroll space. However, it does not appear at this point that any deal involving Zobrist is close." No to a Zo trade. I can never forget that seventh game double in the WS. He is untouchable to me.